I am a jewelry hoarder. A total boho at heart, my collection mainly comprises of silver, lucky gemstones, chunky beads and quirky artifacts. If the house was on fire, I would have a tough time narrowing down on what to run out with. However, there are a few trinkets that have a sentimental hold on me, and I also happen to wear these pieces most often. This post gives you a brief glimpse into my treasure trunk. I’ve shared this piece with you here before. I am even wearing this as I type! 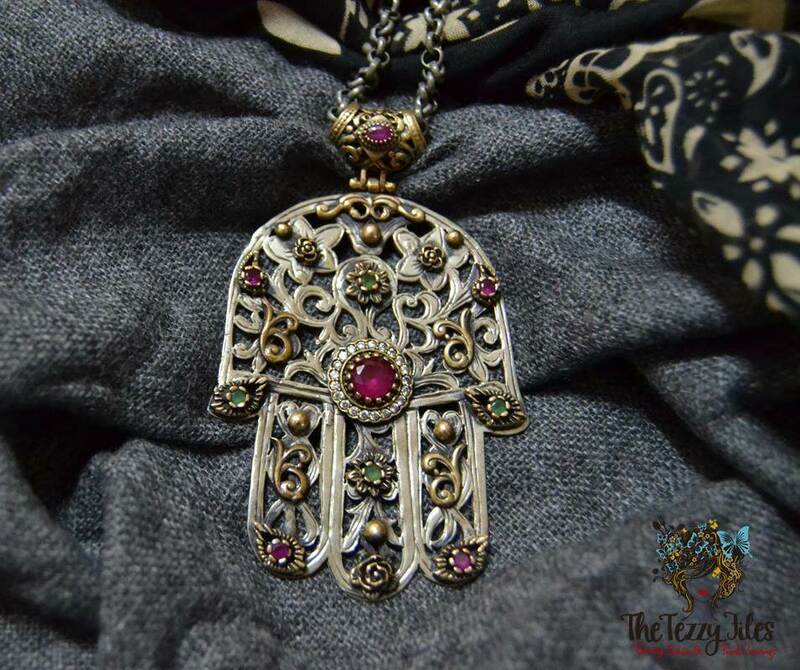 Hamsa (denoted from the Arabic word for ‘five’) is also known as ‘The Hand of Fatima’, and is often worn in Middle Eastern cultures for good luck, and to ward off the evil eye. I have a few hamsa pieces, but by far this pendant is my favorite. It is a rather chunky piece (approximately 10 cm in height), and is made of sterling silver. I bought it at a jewelry exhibition in Sharjah, and the seller told me the design is Turkish. It features a stunning array of ruby and emerald stones with intricate copper work. I love this piece for its uniqueness. I get compliments on it whenever I have it on, and it seems to work well with almost everything in my wardrobe. My mother gifted me this delightfully chunky sterling silver belcher bracelet when I graduated with my first university degree. Adding to this gorgeous gift, my sister got me the graduation cap and scroll charm, and my dear friend Sharmeen got me our university emblem charm. I got both these charms soldered onto the bracelet, and hence started my collection of charms! My charm bracelet includes charms that have a special meaning for me, like the cute little baby booties my father jokingly gifted me for my love of shoes. And the half-coin that has a special prayer inscribed (the other half was given to a close friend). Then there’s the quirky fun charms, like the boot denoting ‘The Little Old Woman’ nursery rhyme. It actually opens up to reveal the old woman and her children. And check out the little toilet; it opens up to reveal a little man reading a book on the bog! The bracelet also has a fair bit of Kiwiana (New Zealand souvenirs) including a Tiki, a mythical Maori, believed to bring good luck. 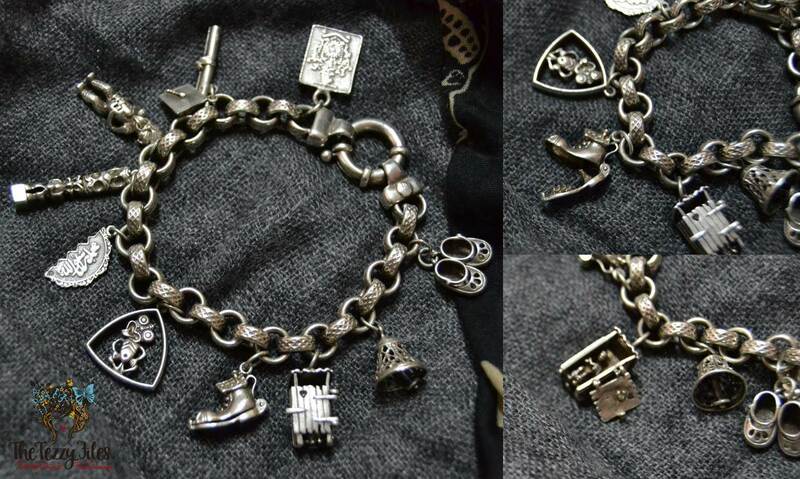 I love this charm bracelet as it is uniquely me. It is an assortment of memories in one piece. A dhool necklace symbolizes the Indian drum. 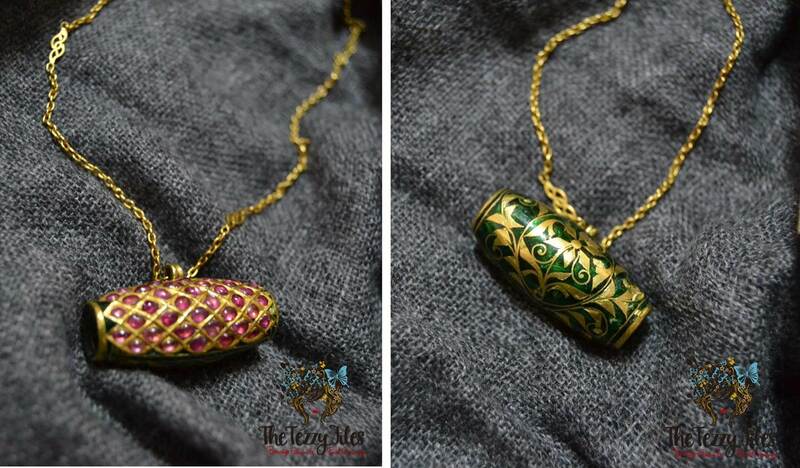 It is a popular piece of jewelry from Assam, the North-Eastern state of India. This particular piece belonged to my maternal grandmother. She inherited it from her mother, and gifted it to me on my wedding day. 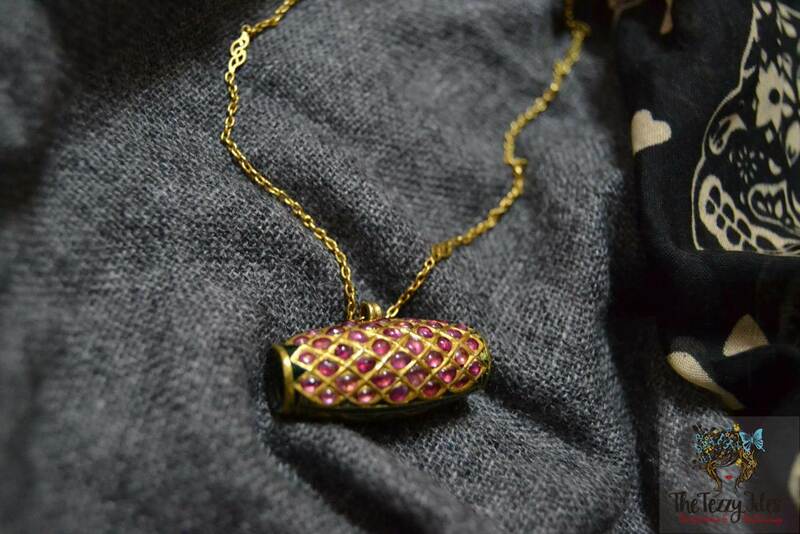 I am the fourth generation to be wearing this dhool, how precious is that! I lost my beloved grandmother last year, and am grateful for having this gorgeous little treasure to remind me of her. The dhool necklace is made of 22 carat gold. The front is encrusted with Burmese rubies, and the back is just as beautiful in green enamel featuring an intricate gold design. It can therefore be worn both sides, adding to its wear-ability with a wider selection of outfits. My husband got me the conventional solitaire, and on our engagement day, I was also gifted his mother’s Assamese ring. This is yet another heirloom piece that has been passed down several generations within my husband’s family. For me, this ring has more emotional value than my solitaire. It is made of 22 carat pure gold, and features Burmese rubies on the face. What makes these Assamese heirloom rings more special is that the actual face of the ring is centered around an ancient ‘Ahom’ gold coin. The Ahom dynasty ruled Assam, the North-Eastern state of India, for several generations. They traded in gold coins, and many of these have been preserved in the form of jewelry, and passed down generations. 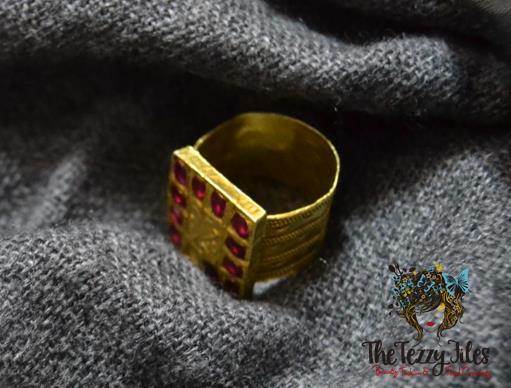 This ring is therefore a piece of Assamese history, as well as a family heirloom. Pieces like these are truly invaluable. 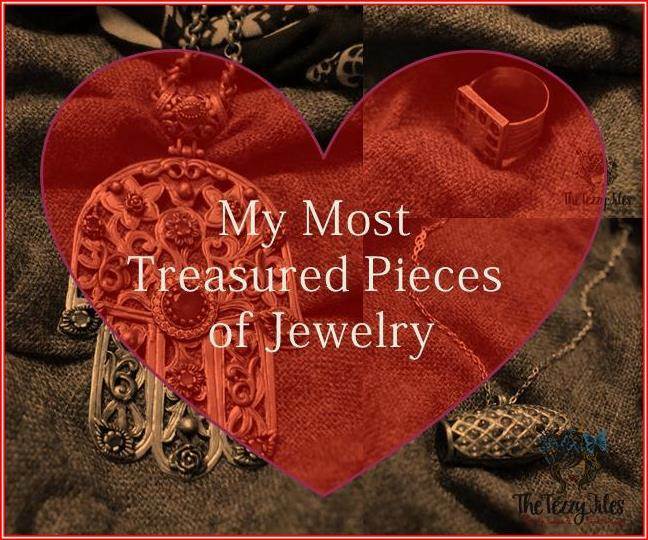 These are four of my most treasured jewelry pieces. What are yours? Perhaps you’d like to check out the jewelry auctions on invaluable.com It is a virtual treasure-trove worth clicking through. You might just find your best piece yet, for a bargain price! Posted in Tezzy's Wardrobe and tagged fashion, heirloom, jewelry, treasure. Bookmark the permalink. Thank-you very much Saajida! Assamese jewelry is stunning, do look it up.